Tim became a PGA member in 1997. Tim Butler, a long time employee of Baltimore County Golf, played golf at Towson High and participated in many Mid-Atlantic Junior Tournaments. He turned professional in 1990 and became a PGA member in 1997. While working at Sparrows Point Country Club and The Suburban Club of Baltimore, Tim developed, organized and ran a very successful junior program. Tim began his career with Baltimore County Golf at Greystone Golf Course as a First Assistant and then the Head Golf Professional. He has served as the Assistant General Manager at Diamond Ridge and The Woodlands Golf Courses where he is now the Head Golf Professional. 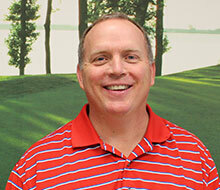 Tim continues to play competitive golf at numerous MAPGA and VSGA Professional events. In addition to being a very active Junior Golf Leader, Tim teaches individual and group lessons to all levels of golfers.